Reli-a-Flex® Couplings: The Reli-a-Flex® range of flexible shaft couplings, also known as a beam coupling, is an aluminium alloy, one piece configuration, which has been designed in-house at Reliance to provide very smooth transmission of motion, high torsional stiffness, low bearing loads, and long life. The patented slot pattern was developed after many months of analysis and test to provide the best balance between zero backlash, torsional stiffness and low bearing load, whilst attaining an operational life in excess of 50,000,000 cycles at rated load and 80% offset. With two sets of identical slots, the Reli-a-Flex® flexible beam coupling is constant velocity by design and handles angular, parallel and axial offset. Available in sizes from 6 to 25 mm diameter and allowable speeds up to 70,000 rpm, our Reli-a-Flex® couplings provides a very reliable one piece coupling design that approaches the performance of a bellows coupling. 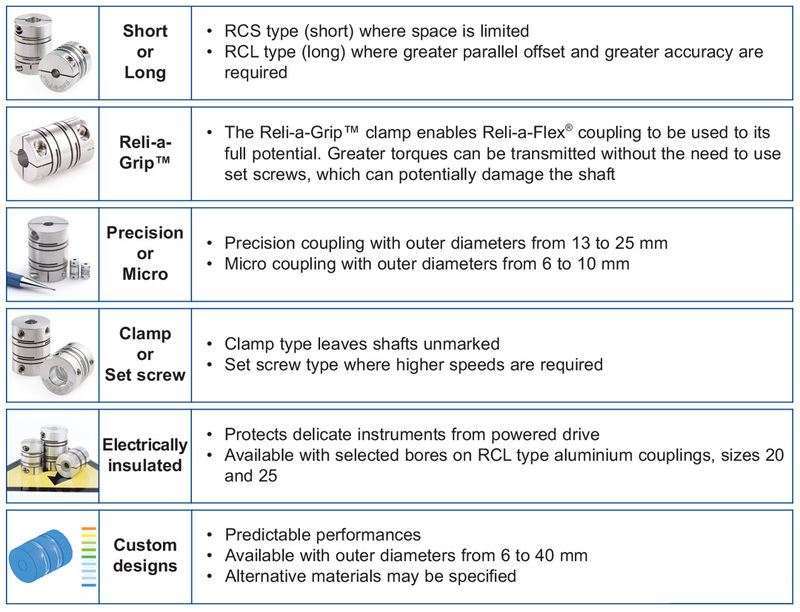 Also for customers that require a modified or completely bespoke Reli-a-Flex® flexible beam coupling, Reliance has developed a unique computer-based design and performance prediction tool. This tool allows our engineers to experiment quickly with different coupling configurations and to design a coupling to meet either space envelope restrictions or performance requirements.